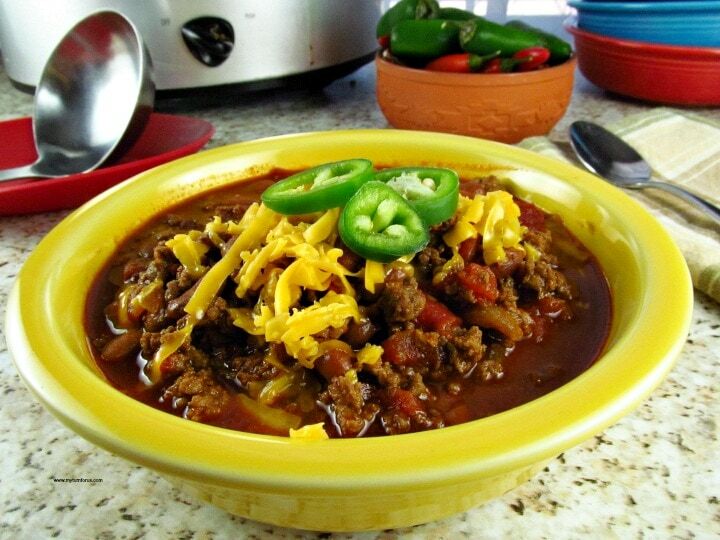 An Easy Texas Chili with Beans recipe made with turkey or beef. Some say that Texas Style Chili doesn’t have beans, but we love our Texas Chili recipe with Beans. Our easy Texas Chili with Beans recipe is the way to enjoy this Texan comfort food without a lot of work. There are souls out there that believe authentic Texas Chili is made without beans and tomatoes, but we beg to differ. We make the easiest homemade Texas Chili with beans and top it with sliced jalapenos and longhorn cheese aka cheddar cheese. Anytime the weather cools below 70 degrees here on the Ranch, I start craving a pot of chili or chili beans. But we don’t wish to spend the whole day in the kitchen so we use a couple of simple shortcuts. And we don’t wish to wait to cook dry beans, we use a can or two of Ranch Style Beans. 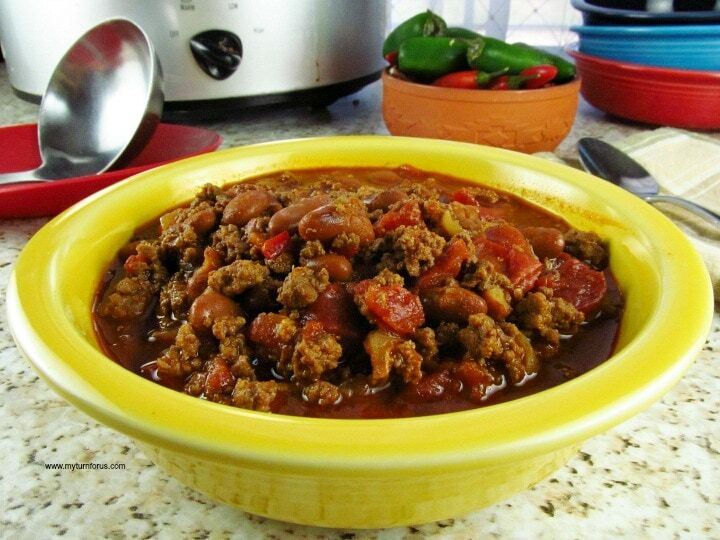 It makes this pot of Texas Chili with beans quick and easy. We also have a couple of other tricks up our sleeves such as this Mix N’ Chop utensil. 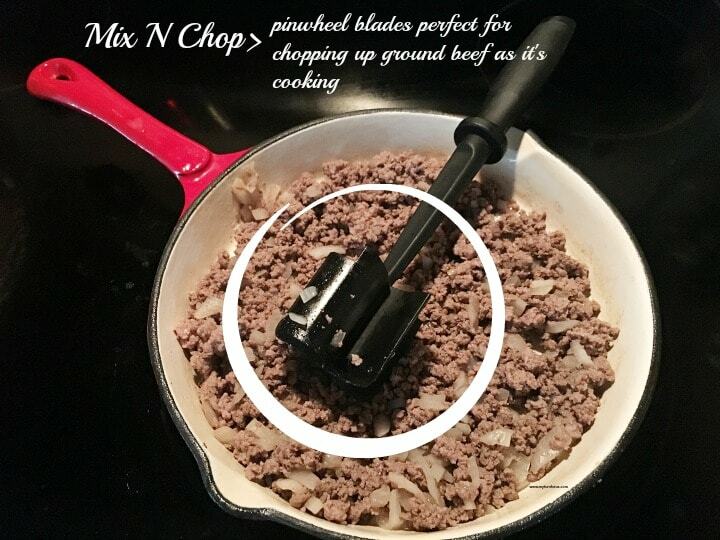 We have a couple of these Mix N’ Chop’s (even bought some for our children) and use them all the time when cooking ground beef, ground chicken or ground turkey. It makes it so much easier. So pull out your slow cooker aka crock pot and get this chili started! It’s also great for game day, it’s easy and can be doubled to feed a crowd. Rain is in the air here at the Ranch so we have a crockpot filled with this Texas Chili with Beans bubbling on the stove. And we have a pan of homemade cornbread in the oven. An easy Texas-style chili using Ranch Style beans. Brown ground beef (or turkey) and chopped onions in a large skillet then add garlic and jalapeño, cook for 2 more minutes. NOTE: using a Chop & Mix inexpensive utensil makes cooking ground meat so easy. Serve with grated cheese and sliced jalapenos sprinkled on top. This looks so good with all of that cheese on top!! Just found your blog today and linked with you. My husband and I also want to travel full-time in an RV sometime soon, so I'd love to hear what plans you're making to do this. It does sound like fun, doesn't it?? Love your chili recipe; we're trying to eat healthier as well. your turkey sounds and looks good! i am new here from a blog hop. and i see you sponsor some hops too. I will be joining up on some. and i am a new follower of you! 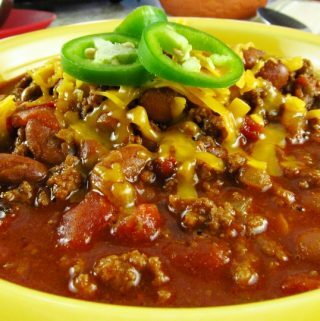 I love chili, it is one of my all time comfort foods. Thanks for sharing! I just had chili last night and chili mac tonight. 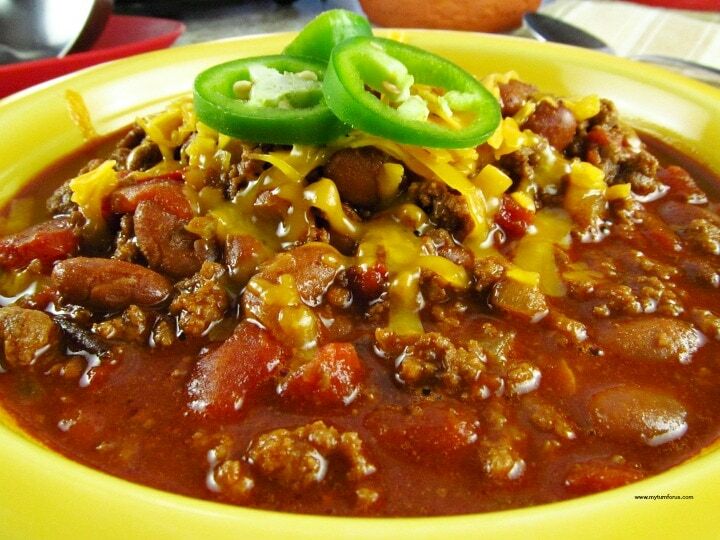 Chilly nights are ideal for chili dinners. Thank you for sharing in the GRAND Social. Hey, I'm a new follower! Found you at the Monday meet-up! It looks yummy, thank you for this very healthy recipe! Yummy!! I made some awesome chili last weekend. Wish my younger kids would eat it, then I would make it more often. They turn their noses up at it though— sad but true! Thanks for linking up to our Healthy Tuesday's blog hop! Thanks for linking up at my Show off Your Shell linky party! My husband is super picky but recently agreed to try chili if I made it! Hooray! I'll have to try this one!! This looks really good! I will need to try it! Yum, I love making turkey chili. It's such an easy swap out half the time I do not even tell the hubs! Thank you so much for linking up at the Oh HAPPY Day Party too! I love chili and making it healthier is the best. Ranch Style beans? That's new to me. What are they? Thanks so much for taking part in our Wonderful Wednesday Blog Hop. Please stop by again. Sounds yummy! I love turkey burgers! Thanks for sharing. Evelyn, Thank you sharing at my link party. I pinned your chili and love it. I hope I fixed my reply message today. Let me know if it worked. Happy Valentine's my friend! Greetings from foodie friday. This looks rather yummy. Your Turkey Chili looks wonderful and very healthy, it would be great on this cold winter day. Hope you are having a great Valentine weekend and thank you so much for sharing with Full Plate Thursday. 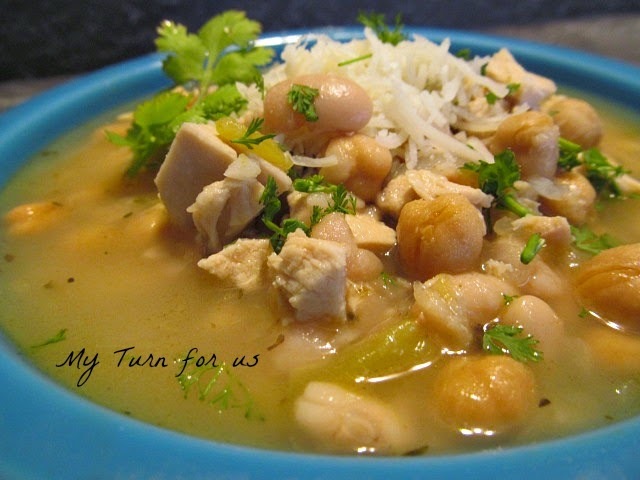 Turkey chili is delicious – a much healthier alternative. It can also be made with meatless vegetable crumbles – visiting from the Thursday Favorite Things hop. I love turkey chili and finally got my big guy converted too. Amazing how much fat and calories this eliminates. Your recipe is a bit different. I will be adding it to my files. Thanks for sharing. This looks really yummy! Thanks for sharing at Fluster's Creative Muster. Looking forward to seeing what you link up next week. Those jalapenos are huge! I've been trying to use ground turkey in place of beef more often. But I still can't get used to turkey burgers lol! Your chili looks so good! Thank you for linking w/ See Ya in the Gumbo this week. Thanks for linking up to the Crafty Thursday Obsessions link party! Hope to see you back again this week! YUM, this is a great keeper-recipe! You can never go wrong with a good chili! Evelyn, featuring your delicious chili on this week's blog hop. Stop by to check it out tonight and add some links. This looks fabulous! I'm with you on needing to get past the Super Bowl for a diet. Haha! I love Turkey Chili! It's a staple in our house every winter. Thanks for sharing with us at Real Housemoms for Fabulous Fridays! I have a turkey chili recipe, but will have to try yours! Looks so yummy! Thanks for sharing & linking up @ DearCreatives.com hope your having a great week! & hope to see you this week. Yummy one of my favorites to serve! I will have to try this version. I've never thought of adding garbanzo beans to chili, but it looks tasty. I like the fact it uses turkey instead of beef too. Thank you so much for sharing with Saturday Spotlight. Have a great week and come back soon! Sounds delicious! Thanks for sharing your recipe at Artsy Corner, can't wait to try it! Mmmm! My family are big chili eaters and I'll bet they would love this Turkey and crock pot version. I like that it simmers in the crock pot all day…what a treat to come home to! Thanks for sharing this light recipe at our party! Thank you thank you thank you for helping by sharing this recipe!